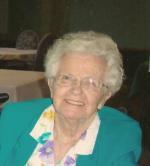 Helen Louise (Lukity) McCartney age 90 of Ashland passed away Friday December 24, 2010 at the Bradford House at Brethren Care Village. Born on July 16, 1920 the daughter of Perry and Mildred (Kilmer) Heestand in Spencer Ohio she had been a resident of Ashland County for seventy three years. Mrs. McCartney also had been a resident of Bradenton, Florida and St. Paris Ohio for seventeen years. Mrs. McCartney was a graduate of the Ashland High School Class of 1938, and had been employed at the Ashland Times Gazette in the advertising department from 1957 till her retirement in 1985. After her retirement she was employed at Home Hardware. On May 7, 1988 she was married to Donald S. McCartney who preceded her in death on August 24, 2005. Survivors include two sons and daughters in law, one daughter and son in law, Stanley (Jackie) Lukity of Zionsville Pennsylvania, Dennis (Beverly) Lukity of Ashland and Norma (Jack) Sturgeon of Mansfield Ohio. Also surviving are step-children, Don (Kathy) Kilgallon of Greenville Ohio, Mike (Maggie) McCartney of Vero Beach Florida, Jim (Judy) McCartney of Centerville Ohio; Dennis (Mary) McCartney of Bevercreek Ohio and Joyce Vonderheid of Mt. Orab Ohio. She is preceded in death by her parents, two brothers, Stanley and Wilbur Heestand and three sisters Genevive (Dean) Walker, Wilma Griner and June Wolfe. Mrs. McCartney is a member of the Third Street Church of the Brethren in Ashland and was a member of various Golf and Bowling leagues as well as a member of the Sweet Adelines. Funeral services will be held on Tuesday December 28, 2010 at 12:00 p.m. at the Heyl Funeral Home with Chaplin Don Earlenbaugh officiating. Burial will follow the funeral service at the Black River Church of the Brethren Cemetery in Spencer Ohio. Friends may visit with the family from 10-Noon on the day of the funeral service at the funeral home.